Matt and his wife pursued fitness as a couple, strengthening their bond and bodies alike. 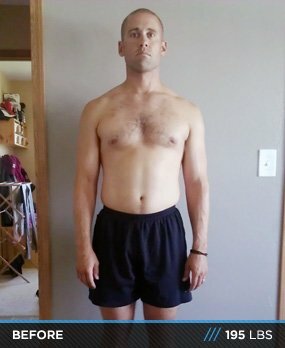 See how Matt shaved 4 inches off his waist and discovered a new way to live! I was looking for a change to my workout. My wife was considering trying something different and to support her venture, I decided to join with her. I was an athlete in college and I have been working out for years but I was always training like an athlete, not to maintain my fitness. My diet and exercise patterns had become predictable and changing it up seemed like the right option. During the summer, I am a college coach and we are on the road almost every day of the week. My eating, sleeping and workout habits had fallen off. Also, my wife and I have 2 children and I found myself not eating properly because I would finish their leftovers rather than putting them away. After discussion with my wife, we decided to join Hitchfit.com online as a couple and work with Micah Lacerte to change our fitness and nutrition levels. We were excited to try something different and we were ready for the commitment to changing our lifestyle. With Micah's help, we were going to make our lives healthier. The only way that I made it through this exciting 12 weeks of lifestyle changing workouts was with the support of my wife and kids. They were always there to support me and prevented me from giving up at certain stages. Once we received our workouts and nutrition plan, my wife and I started planning out the times that we would work out so that it didn't interfere with our family time and also started planning our meals in advance. It was very important for us to plan our meals in advance for the week and prepare our food 1 to 2 days before to prevent snacking and just eating what was quick. The great part about the 12 weeks was that when my weight was starting to plateau in my lifts, the workout changed and I started to see gains in strength and changes in my physical appearance. I also started to have more energy throughout the day. After the first couple of weeks, I started to see the results with the workouts. I had never done cardio in the way that was prescribed for me during the Hitchfit 12 week workout. I was always just casual with running or cardio but this program really turned up a notch and I started to see results instantly around my stomach area and in my arms. I did go through some stages where it was difficult to complete certain parts of the workout, but with constant support from my wife and Micah, I was able to push through the tough times and the results that I achieved at the end were above anything I thought that I could accomplish. It was by far the best 12 weeks I have ever had with a workout and it has honestly changed my lifestyle. Never give up! When the workout gets difficult and you think that you can no longer continue, remember why you are doing this and what you will feel and look like at the end. For me, it was my kids and wife. I want to live a long life with them and by doing this workout, I feel that I am on the right track. I know that sounds funny that a 34 year old is worried about living a long life, but you never know how much time you have left with the ones that you love. Also, make it a priority. There is always time in the day where you can complete the workouts and prepare your meals. You might have to sacrifice other things but you will not regret the results at the end. If you are serious about making a lifestyle change, this will become one of the most important tasks that you need to accomplish during your busy day.